Unegrande journée d'action pour défendre l'éducation publique estorganisée aux Etats-Unis le 4 mars 2010. Carte qui recense plus d'une centaine d'actions prévues dans 22 états différents sur le site Student Activism. Sur le site The Huffington Post, l'actualité en direct du mouvement étudiant en Californie. 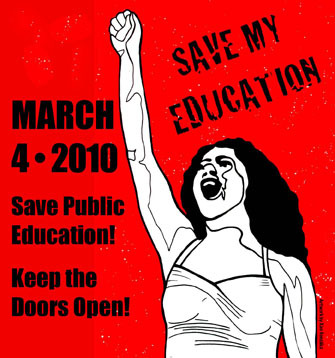 March 4 in Sacramento – "Educate the State !" rally ("I've got the 'California Say Goodbye to My Education' Blues") : http://www.youtube.com/watch?v=Jpu-k1_FWWc. March 4 commercial (long version – California) : http://www.youtube.com/watch?v=5QcgQYk8ReQ&NR=1. March 4 commercial (Arizona) : http://www.youtube.com/watch?v=gA_IYqfVLEM&NR=1. March 4 Schools commercial (Arizona) : http://www.youtube.com/watch?v=q7yh5J1ym0Q&feature=related. March 4 – Have you heard ? (student organizing commercial) : http://www.youtube.com/watch?v=iGbGnVISmyI&feature=related. "As protests erupt Thursday, experts say California's higher education fee hikes actually help the poor", MercuryNews. "Will the call become 'Go east, young man' ? ", San Francisco Gate. "Governor supports peaceful student protests", San Francisco Gate. "Thousands rally on campuses, streets for schools", San Francisco Gate. "Angry US students protest cuts to higher education", Associated Press. "Rowdy protests target funding cuts at US campuses", Associated Press. On March 4, California Faculty Association members will join withstudents and education workers from all segments of public education inCalifornia to “Mobilize for Education.” Turns out, California will not be marching alone. Organizations have planned similar actions in 17 other states,including Connecticut, Iowa, Kansas, Maryland, Massachusetts,Michigan,Minnesota, New Jersey, New Mexico, New York, North Carolina, Ohio,Pennsylvania, Rhode Island, Tennessee,Texas and Washington (state). Seethe listings below to learn more about events in California and aroundthe nation. Rallies, demonstrations, sit-ins and marches are planned for March 4on or near all 23 Cal State University campuses, which have experiencedover $1 billion in funding cuts over the last two years. Last fall, more than 800 students and faculty members from all overthe state met at UC Berkeley to plan one, unified day of action onwhich the education community would band together to advocate forpublic education at every campus and school. From pre-schools to universities, public education in California isbeing decimated. K-12 spending continues to shrink ; Californiais now47th in public spending per pupil. And, the state has slashed highereducation spending. The California State University has let go some 2000 Lecturers overthe last two years. Student fees tripled since 2002 while thousands ofclass sections have been eliminated. Tens of thousands of eligiblestudents have been turned away or given up because of rising costs andinability to get necessary classes. In his state budget proposal for 2010/11, Gov. Schwarzeneggerproposed over $300 million each in funding increases for the CSU and UCsystems, but that is not nearly enough to fill the deep hole left bymassive funding cuts over the last two years. Unegrande journée d'action pour défendre l'éducation publique estorganisée aux Etats-Unis le 4 mars 2010. Parti de Californie pourprotester contre la politique du gouvernement de cet Etat, et notammentles restrictions budgétaires drastiques qui ont menacé tantl'enseignement secondaire que les universités publiques, le mouvements'est étendu à l'ensemble du pays. Voir la carte qui recense plus d'une centaine d'actions prévues dans 22 états différents sur le site Student Activism.